During query execution, when the index path is chosen, the query engine requests the scan by providing a range of values to return. This range is represented as a span in the query plan. Index scans play a major role in optimizing the query plan generation and execution. This section discusses how index spans are generated from query predicates and provides a number of examples. Couchbase N1QL is a modern query processing engine designed to provide SQL for JSON on distributed data with a flexible data model. Modern databases are deployed on massive clusters. Using JSON provides a flexible data mode, and N1QL supports enhanced SQL for JSON, to make query processing easier. Applications and database drivers submit the N1QL query to one of the available Query nodes on a cluster. The Query node analyzes the query, uses metadata on underlying objects to figure out the optimal execution plan, which it then executes. During execution, depending on the query, using applicable indexes, the Query node works with the Index and Data nodes to retrieve and perform the planned operations. 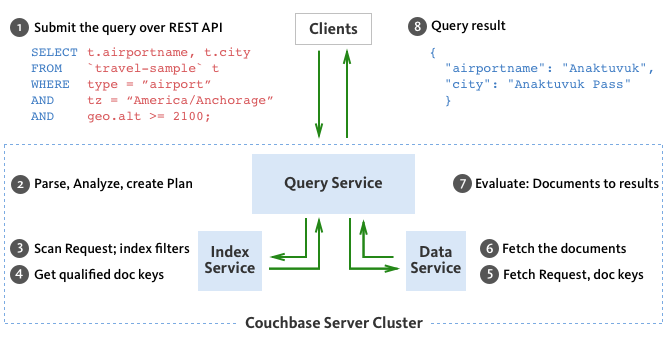 Because Couchbase is a modular clustered database, you scale out data, index, and query services to fit your performance and availability goals. This figure shows all the possible phases a SELECT query goes through to return the results. Not all queries need to go through every phase, some go through many of these phases multiple times. For example, the Sort phase can be skipped when there is no ORDER BY clause in the query; and the Scan-Fetch-Join phases will execute multiple times for correlated subqueries. This brief introduction to query planning has details of query planner. When the Index path is chosen, query engine requests the scan by providing the range of values to return. This range is represented as a SPAN in the query plan. The index spans will play major roles in optimal plan generation and execution. Here, we discuss how the Index spans are generated from the query predicates (filters). Query predicates indicate the subsets of data that we are interested in. During the query planning phase, we select the indexes to be used. Then, for each index, we decide the predicates to be applied by each index. The query predicates are translated into spans in the query plan and passed to the Indexer. Spans simply express the predicates in terms of data ranges. The examples on this page illustrate the spans for different predicates and require the following indexes. Note that the above codeblock shows the entire EXPLAIN plan, but the examples below show only the "spans" section. In N1QL, Index Scan requests are based on a range where each range has a start value, an end value, and specifies whether to include the start or the end value. A "High" field in the range indicates the end value. If "High" is missing, then there is no upper bound. A "Low" field in the range indicates the start value. If "Low" is missing, the scan starts with MISSING. Inclusion indicates if the values of the High and Low fields are included. Neither High nor Low fields are included. Only Low fields are included. Only High fields are included. Both High and Low fields are included. In this example, the predicate id = 10 is pushed to index scan. In this example, the predicate id >= 10 is pushed to index scan. In this example, the predicate id <= 10 is pushed to index scan. This query predicate doesn’t contain an explicit start value, so the start value will implicitly be the non-inclusive null value. In this example, the predicate id < 10 is pushed to index scan. The query predicate doesn’t contain an explicit start value, so the start value will implicitly be the non-inclusive null value. In this example, the predicate id >= 10 AND id < 25 is pushed to index scan. In this example, the predicate id >= 10 AND id < 25 AND id <= 20 is pushed to the index scan. Observe that the optimizer created the span without the id < 25 predicate because the AND predicate id <=20 makes the former predicate redundant. Internally, the optimizer breaks down each predicate and then combines it in a logically consistent manner. FYI: If this is too detailed for now, you can skip over to Example 8. Combined Inclusion becomes OR of corresponding inclusions of Step 1 and Step 2. Repeat Steps 1 to 3 for each AND clause. In this example, the predicate id > 10 AND id < 5 is pushed to index scan. This is a special case where the span is Low: 10, High: 5, and Inclusion: 0. In this case, the start value is higher than the end value and will not produce results; so, the span is converted to EMPTY SPAN, which will not do any IndexScan. In this example, the predicate id BETWEEN 10 AND 25 (that is, id >= 10 AND id <= 25) is pushed to index scan. In this example, the predicate id = 10 OR id = 20 produces two independent ranges and both of them are pushed to index scan. Duplicate ranges are eliminated, but overlaps are not eliminated. In this example, the predicate is id IN [10,20] (that is, id = 10 OR id = 20). After eliminating the duplicates, each element is pushed as a separate range to index scan. In version 4.5, up to 8192 IN elements are pushed as separate ranges to the index service. If the number of elements exceed 8192, then the index service performs a full scan on that key. In this example, the predicate (id BETWEEN 10 AND 25) OR (id > 50 AND id <= 60) is pushed to index scan. In this example, the predicate id <> 10 is transformed to id < 10 OR id > 10 and then pushed to index scan. In this example, the predicate id >= 10 AND id < 25 is transformed to id <10 OR id >=25 and pushed to index scan. In this example, the predicate name >= "American Airlines" is pushed to index scan. In this example, the predicate name >= "American Airlines" AND name <= "United Airlines" is pushed to index scan. WHERE name >= "American Airlines"
In this example, the predicate name LIKE "American%" is transformed to name >= "American" AND name < "Americao" (i.e., "Americo" is the next N1QL collation order of "American") and then pushed to index scan. In the LIKE predicate, the % means match with any number of any characters. In this example, the predicate name LIKE "%American%" is transformed and pushed to index scan. In this LIKE predicate '%' is the leading portion of the string, so we can’t push any portion of the string to the index service. "" is the lowest string. is an empty array and is greater than every string value in the N1QL collation order. In this example, the predicate sourceairport = "SFO" AND destinationairport = "JFK" AND stops BETWEEN 0 AND 2 is pushed to index scan. In this example, the predicate sourceairport IN ["SFO", "SJC"] AND destinationairport = "JFK" AND stops = 0 is pushed to index scan. In this example, the predicate sourceairport = "SFO" AND destinationairport = "JFK" is pushed to index scan. In this example, the predicate sourceairport = "SFO" AND destinationairport = "JFK" AND stops >= 0 is pushed to index scan. This example pushes the predicate id = $1 to index scan. In this example, the predicate id >= $1 AND id < $2 is pushed to the index scan. This example pushes the predicate id = $1 OR id < $2 to the index scan. In this example, the predicate id IN [$1, 10, $2] is pushed to index scan. In this example, the predicate v.day = 0 is pushed to ARRAY index scan. In this example, the predicate v.day IN [1,2,3] is pushed to ARRAY index scan. The following examples don’t have the right indexes, or the queries need to be modified to produce an optimal plan. When index idx_absid is used, the predicate abs(id) = 10 is pushed to index scan. In this example, the predicates id <= 100 OR (id BETWEEN 50 AND 150) are pushed to index scan as two ranges.